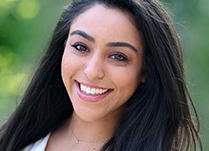 SANTA ANA, Calif. -- On a breezy morning, Floria Hakimi smiled as her photo was snapped on the steps leading up to a small plane that was supposed to usher her to a workshop for real estate agents in Southern California. "Flying out to LA," she posted on her Instagram account with the photo of her donning sunglasses and a broad grin. Later that day, the twin-engine Cessna 414 carrying the 62-year-old real estate agent and four others plummeted out of the sky and crashed into the parking lot of an Orange County strip mall, killing everyone on board. Dashcam video showed the twin-engine Cessna as it fell from the sky, head first, around 12:30 p.m. Sunday. The pilot declared an emergency but didn't state the nature of his problem before crashing about a mile from John Wayne Airport, striking four parked cars, National Transportation Safety Board investigator Albert Nixon said Monday.